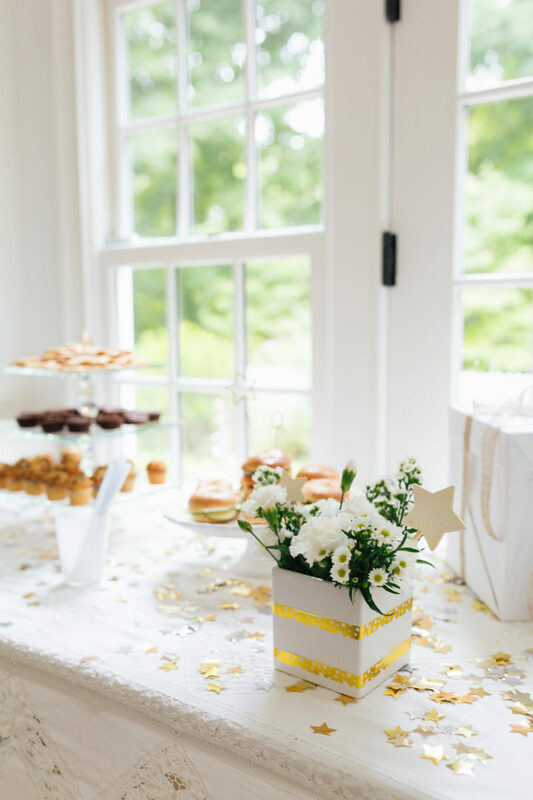 For those of you who haven’t hear of a Baby Sprinkle (as opposed to a Shower) it is a smaller, more pared down celebration of a Mama To Be– and is mostly used for subsequent children or a new gender of child after a big baby shower has already been had. 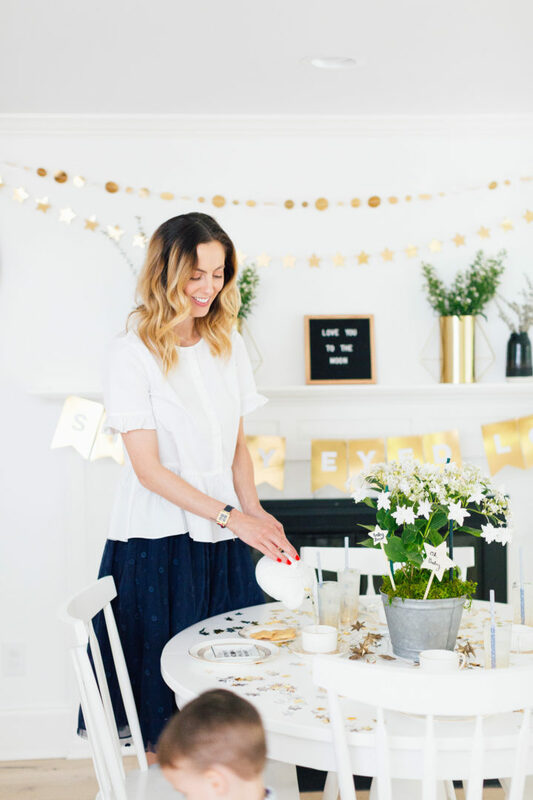 It can also be a great way for a small group of people to honor a Mama who is already having another, bigger shower wherever they live. For example, a group of college friends, or even family members if the Mother to be is coming “home” at any point during her pregnancy. 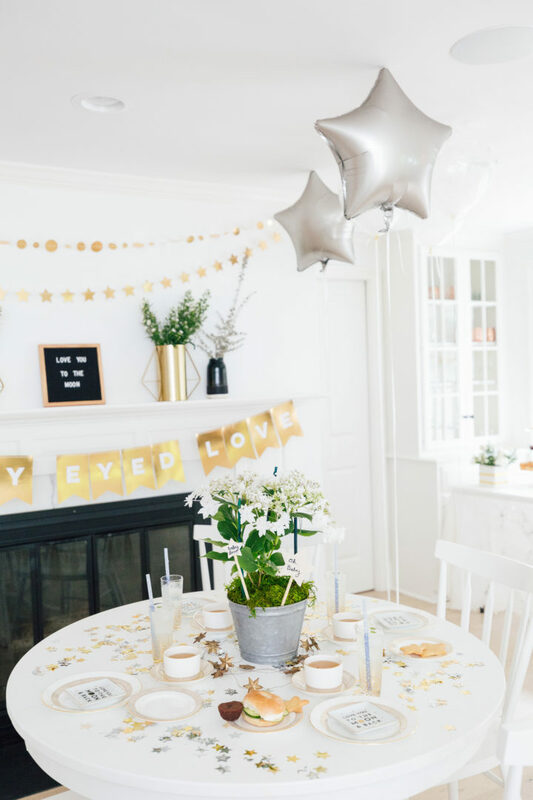 I really love the idea of a Baby Sprinkle, because sometimes a pregnant Mama wants to celebrate her baby but doesn’t want to do an over the top party or is too overwhelmed to be with more than a few people. You get to speak more with the guests, anyway! 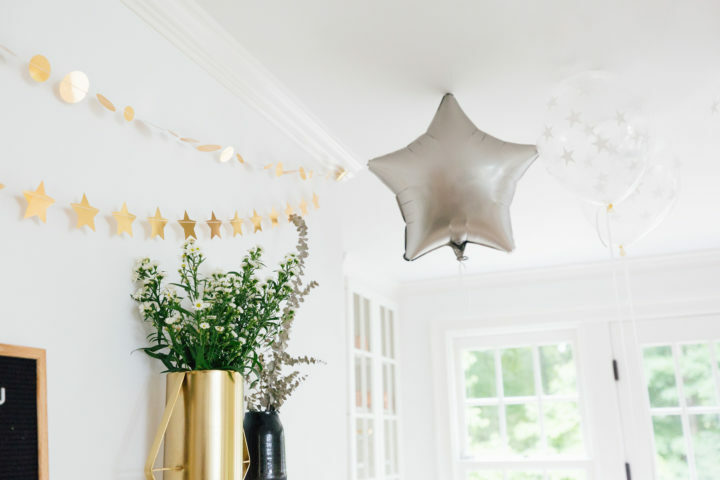 Since I’ve been noticing a big trend among friends and family recently to NOT find out the baby’s gender (especially with second and third children), I decided it would be cool to show some inspiration for a gender-neutral Baby Sprinkle. 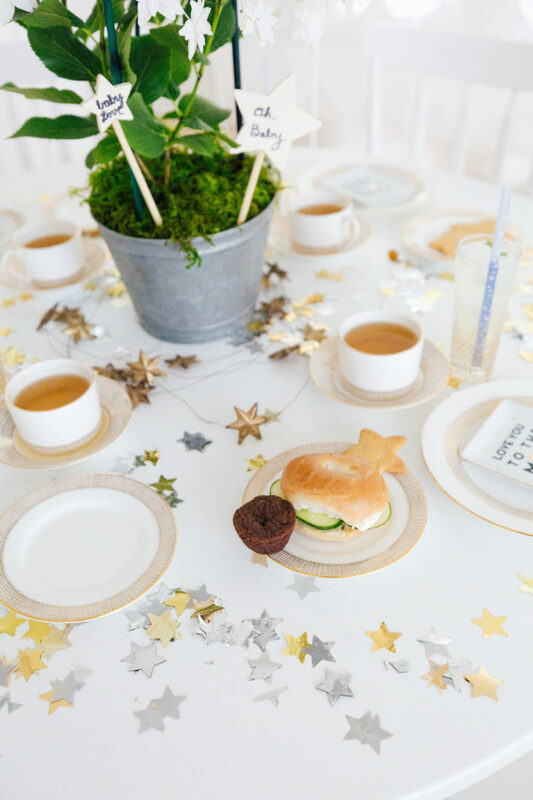 And I knew right away that I wanted it to be a celestial-themed tea party! 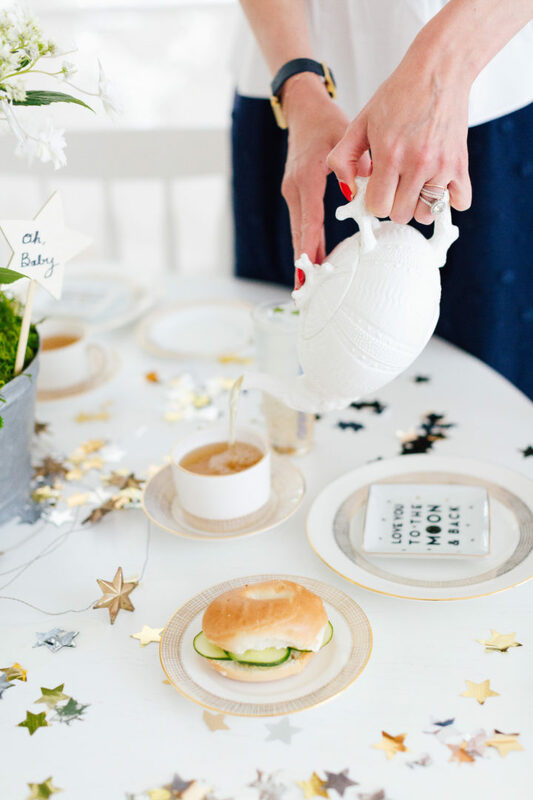 A tea party is such a fun, relaxed, feminine party idea– plus it’s filled with yummy food and drinks that are non-alcoholic by nature! I wanted to go with lots of moon and stars motif, a mostly black and white palette, with accents of metallics. I love how modern everything turned out, while also being very gender neutral. 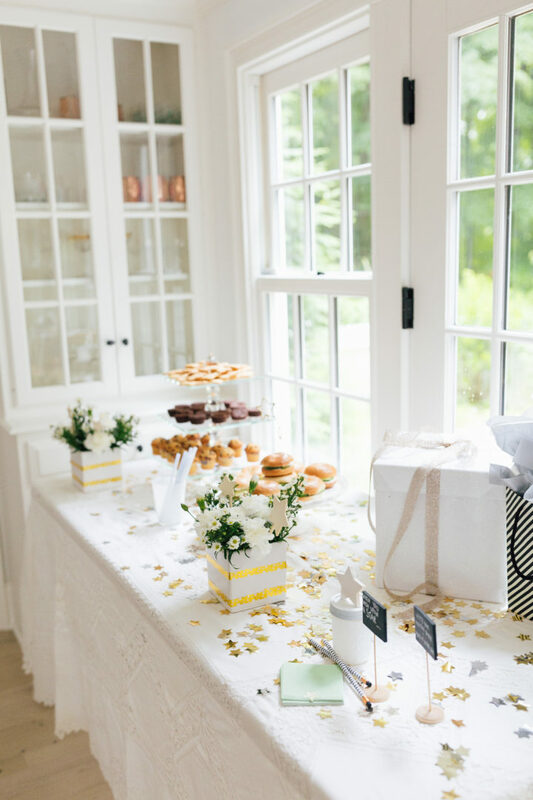 For favors I chose sweet ring dishes that I put on each place setting! Another favorite touch was the “Wish For Baby” Jar. 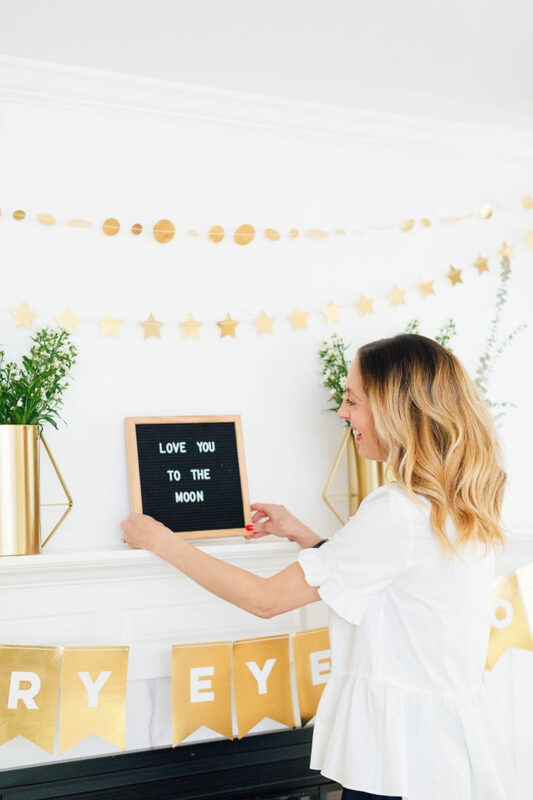 Each guest writes a special message and puts it in a jar for the baby to keep on a shelf in the nursery to bring good luck and beautiful vibes to their life. I made the jar by glueing wooden stars to a mason jar and then spray painting it white. So simple! For food and drink, I kept it simple and yummy. 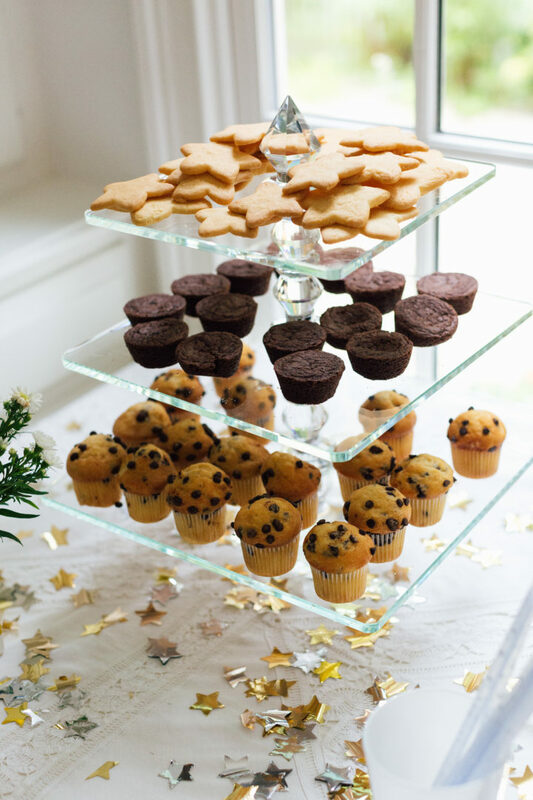 I made star sugar cookies, and mixed them with mini brownie bites and mini muffins. 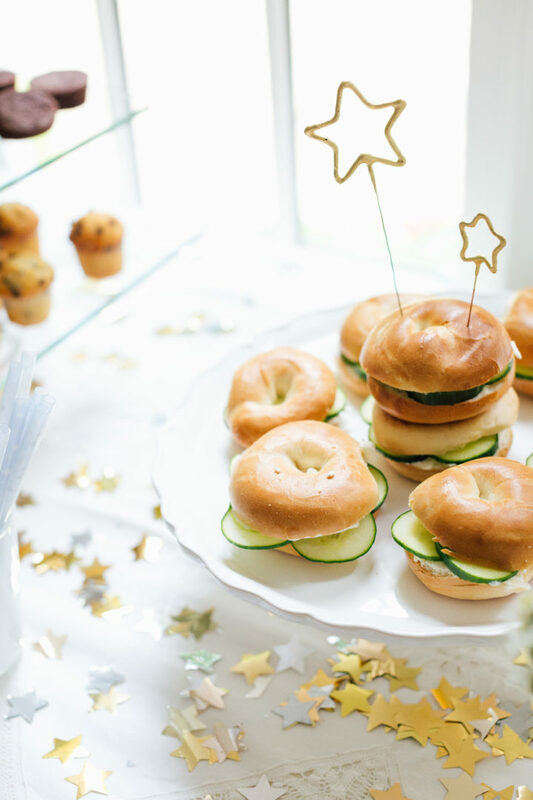 For some more substantial sustenance, I made mini bagel sandwiches with veggie cream cheese and sliced cucumbers. The beverages for the party were hands down my fave! 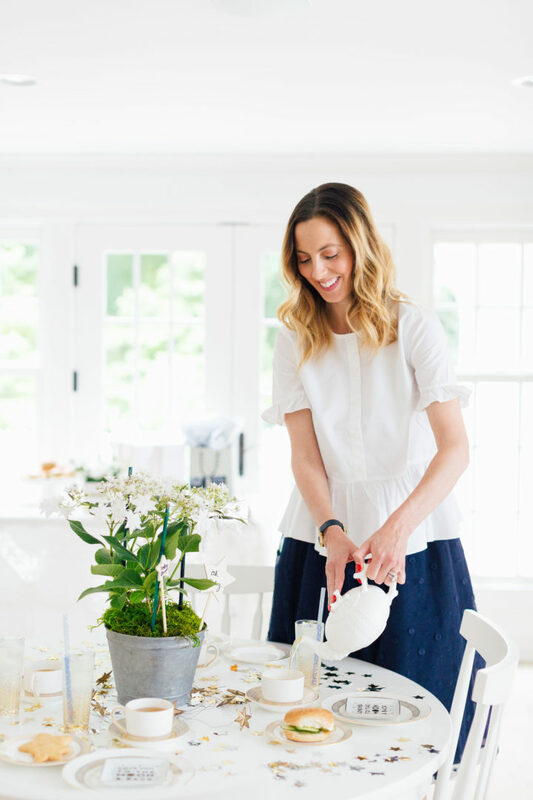 I served Harney & Sons “Yellow & Blue” tea which is one of my favorites ever. 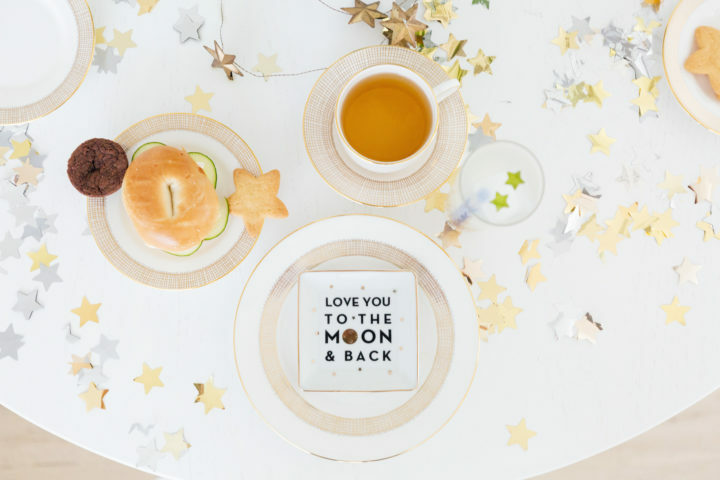 A luxurious blend of lavender and chamomile, it is caffeine free, safe for preggos, and fits the theme perfectly! 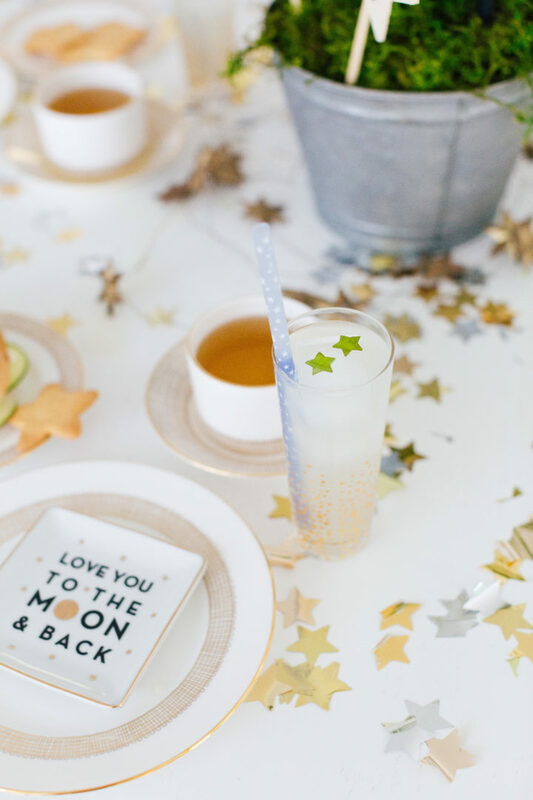 I also served lemonade with ice cubes containing basil stars! I just used a star hole punch to make the star shapes out of basil leaves, and froze them in to ice cubes. They added the sweetest touch to the refreshments. 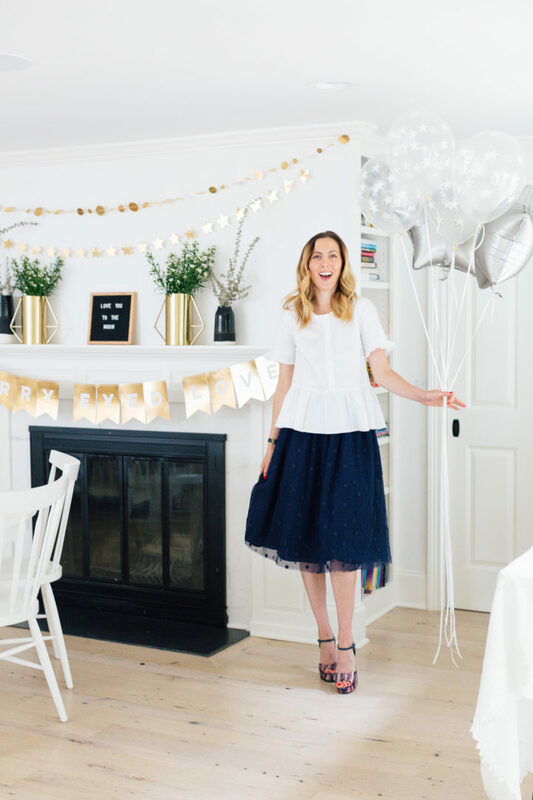 Sister, you are really killing it when it comes to decorating a party! 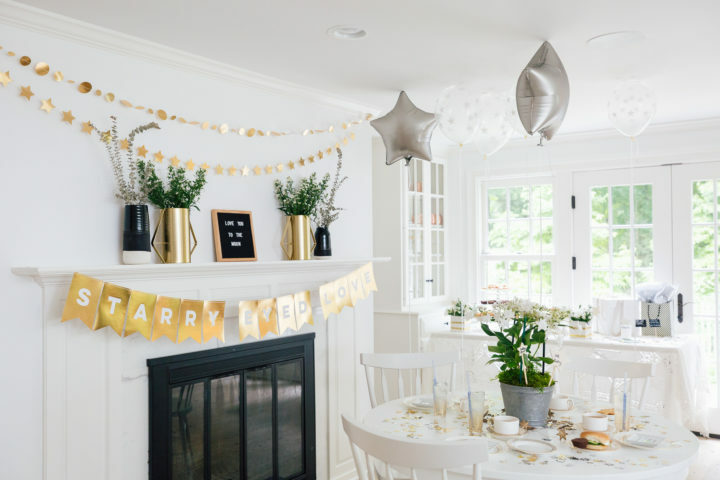 I mean I am always stunned by the decorations of the parties and gatherings in your house which you have posted in your blog! 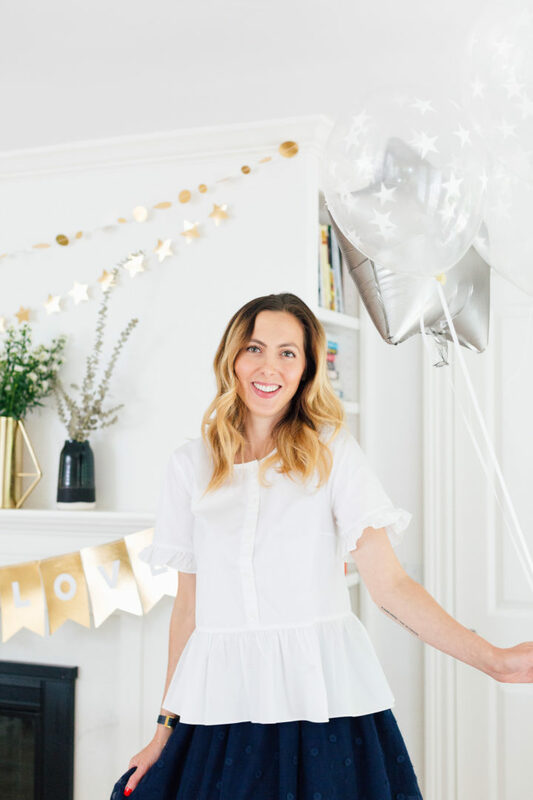 Truly inspirational for those of us who might find the whole process of decorating a party just a little bit boring 😞…Sometimes small details are so important to achieve the festive atmosphere of a party and make guests feel pampered and joyful.I wish you would write a complete guide about organizing and decorating different kind of parties! Thank you Mary!!! I’m so glad you like the vibe! the basil stars in the ice are such a sweet and unexpected touch! 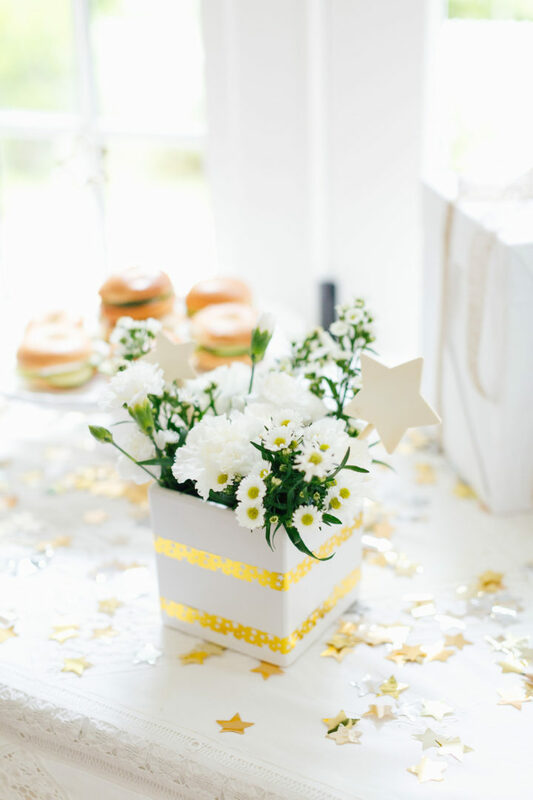 what are your thoughts on having your other kiddos at a sprinkle and/or guests bringing their children? 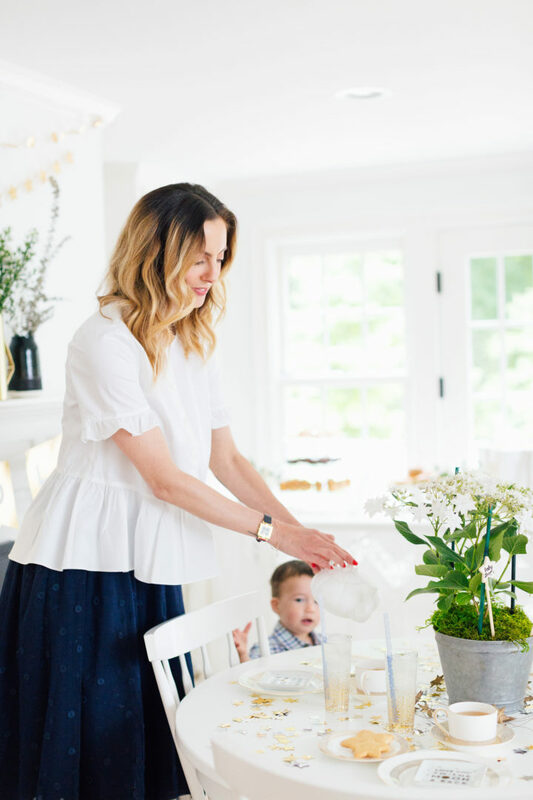 My general feeling about kids at baby showers or sprinkles is: NO. WHY?! 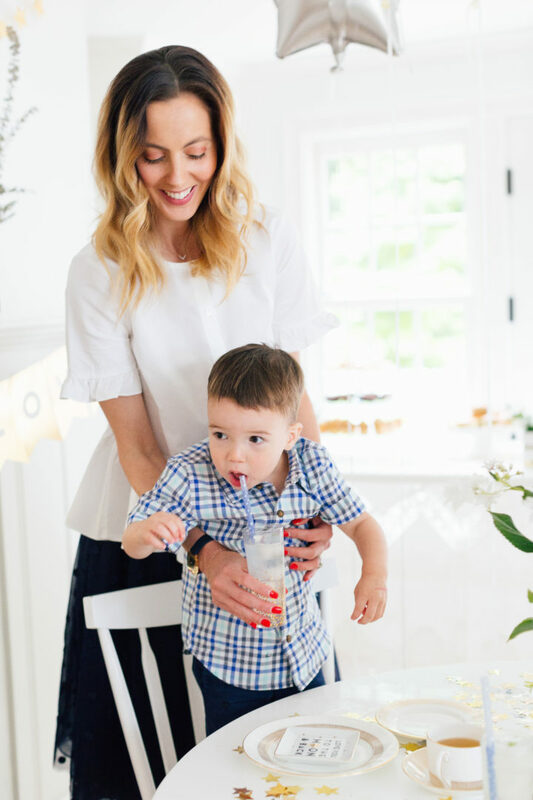 I feel like the mom to be is going to have more than enough baby time once she becomes a Mom, and women who are grown up, married, etc have so few chances to really connect and spend time with their tribe. Just focus on the womanhood connection! Eva! This is incredible. I have been following your blog for years and always enjoy your posts. 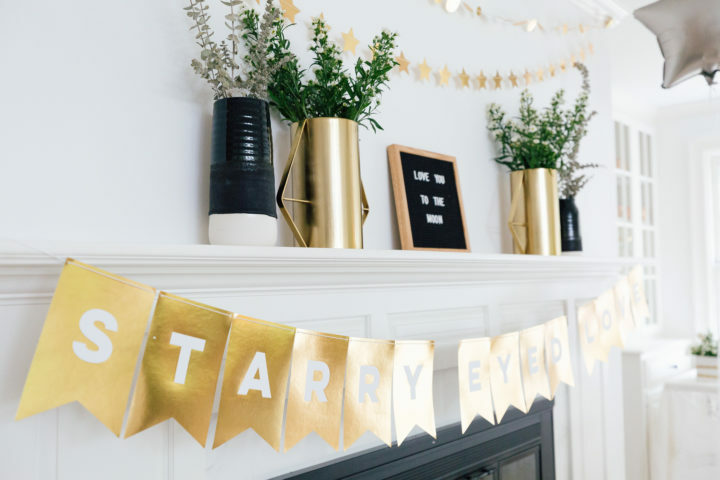 I love the star theme and all the neutral colors with pops of gold. How do you find your inspiration for projects like this? 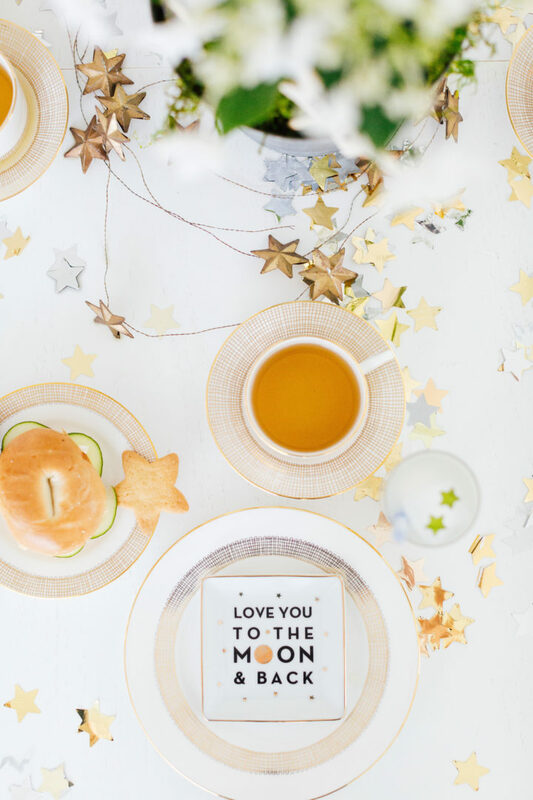 I’m hoping to have an autumnal brunch for my girlfriends and would love to see something like that. Love Eva-thing you do! Love this post! 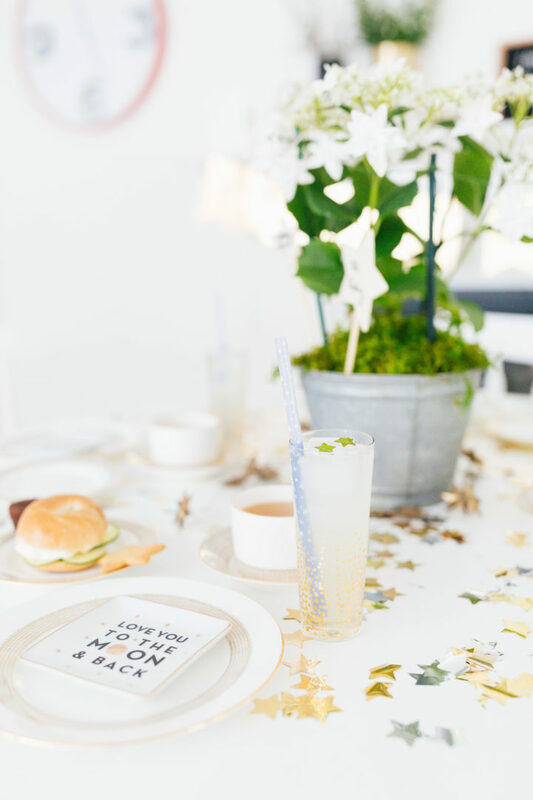 Love the neutral theme with pops of glitter, would even be great for a bridal shower. You are a super entertainer!! This is so stinking cute!! I love this idea. 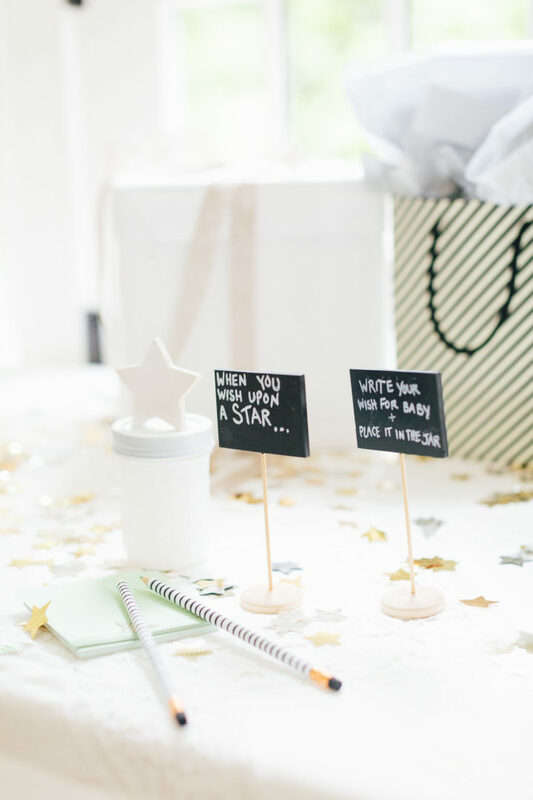 I didn’t actually have a baby shower for my first baby. I was put on bed rest so I felt like I needed to cancel it so maybe I will have a baby sprinkle when we have a second one. Such a lovely idea. I like that’s it’s a lot less pressure! Using a star hole punch for the basil in the ice cubes is such a brilliant idea! You are so creative and your enthusiasm is inspiring. Keep up the good work!